David P. Reimer: Kleine Gemeinde and Evangelical Mennonite Church Elder (Aeltester) and editor: was born 13 June 1894, as the 12th and youngest child of Peter Reimer (1845-1915) and Maria L. (Plett) Reimer (1850-1934) in the village of Blumenort, East Reserve, Manitoba. He married Justina U. Brandt (7 December 1890-16 July 1966) from the Town of Steinbach, on 12 April 1914 in Blumenort. David and Justina Reimer had 12 children, 8 surviving to adulthood. D.P. Reimer died on 2 July 1963. In 1910 he moved with his parents and other family members from the village of Blumenort to a farm located approximately 2 km north of the village, on the SE quarter of section 28, township 7, range 6. David acquired his parent’s farm and lived there the rest of his life. David P. Reimer attended the village school in Blumenort from 1900-1908, an education which was taught entirely in German. Early in his married life he took time to study English, mainly by correspondence courses. This allowed him to become the teacher in the Blumenort village school, to supplement his farming income, and later to serve his community in other ways. In 1929 Reimer was called to be a minister in the Kleine Gemeinde. Between 1940 and 1945 he spent much time in counselling and assisting young men of draft age, accompanying them through the legal system to acquire conscientious objector (CO) status, visiting the various service locations, conducting worship services and providing pastoral care to these young men. He became heavily involved with the CO question. He was a member of the executive of the inter-Mennonite committee of elders and one of the delegates of this committee that went to Ottawa in 1941, to discuss Canada's original promise of military exemption for Mennonite men. 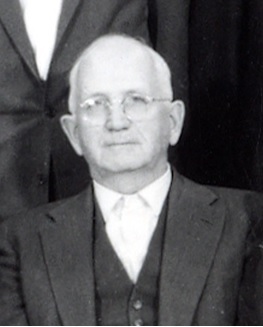 In 1948, after his brother Aeltester (bishop or elder) Peter P. Reimer led a significant number of families from Canada to settle in South and Central America, David P. Reimer was elected as Elder of the Kleine Gemeinde in Manitoba. David P. Reimer continued his involvement with inter-Mennonite organizations concerned with peace and war issues. He was the leader of the Manitoba Kleine Gemeinde in 1952 when they adopted the English name, Evangelical Mennonite Church and later Evangelical Mennnite Conference in 1960. He attended the Mennonite World Conference in Switzerland in 1952 and in Kitchener, Ontario, in 1962. David P. Reimer had a deep interest in colonization. This interest took him on trips, accompanied by other delegates, to evaluate possible desirable locations to recommend to interested church members. In the early 1930s he traveled to the Peace River district of Alberta. In the 1940s he traveled to Mexico to investigate options, which led to a migration and the establishment of Quellenkolonie (Los Jagueyes Colony) in the Chihuahua state of Mexico in 1948. David Reimer was the founding editor of the Christlicher Familienfreund, the official German-language periodical of the Kleine Gemeinde, a role he had from 1935-1959. From 1946-1959 he served on the Mennonite Encyclopedia board and wrote a number of articles for this project. He was also involved as the editor of several books including Experiences of the Mennonites in Canada during the Second World War (1946?) (published in German and later in English), Familienregister der Nachkommen von Grosseltern Kornelius und Sara Plett (1953), Familienregister der Nachkommen von Klaas und Helena Reimer mit Biographien der ersten drei Generationen (1958) and Brandt reunion (July 21, 1962) and family tree (1963). David P. Reimer had a keen interest in the issues and concerns of the churches, and he loved to read, research, and share about these, through the written and published word. GRANDMA (The Genealogical Registry and Database of Mennonite Ancestry) Database, 17-09 ed. Fresno, CA: " California Mennonite Historical Society, 2017: #13726. Plett, Delbert F. Plett Picture Book. Steinbach: D.F. Plett Farms Ltd., 1981: 72. Reimer, Sara. “Biography of David P. Reimer”. Peter P. Reimer 1845-1915 family book. Blumenort: Abe R. Reimer, 1984: 167-168. Redekopp, Alf. "Reimer, David P. (1894-1963)." Global Anabaptist Mennonite Encyclopedia Online. December 2017. Web. 20 Apr 2019. http://gameo.org/index.php?title=Reimer,_David_P._(1894-1963)&oldid=156132. Redekopp, Alf. (December 2017). Reimer, David P. (1894-1963). Global Anabaptist Mennonite Encyclopedia Online. Retrieved 20 April 2019, from http://gameo.org/index.php?title=Reimer,_David_P._(1894-1963)&oldid=156132. This page was last modified on 12 December 2017, at 17:11.